Alonzo Johnson, a machinist from Springfield, Mass., is a holder of two US patents for calculating devices: patent 73732 from 28 Jan. 1868 and patent 85229 from 22 Dec. 1868). The first patent is granted to Alonzo Johnson and James A. Loomis, who was also a machinist from Springfield. The patent models of both devices (up to 1880, the US Patent Office required inventors to submit a model with their patent application) are still preserved in the National Museum of American History, Washington, D.C. (see the images below). 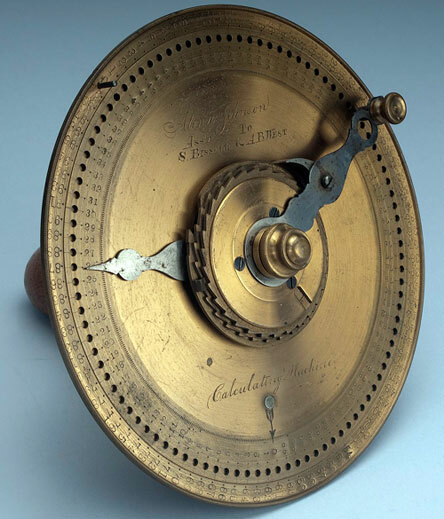 The first calculating device, patented by Johnson and Loomis, is used to add numbers up to 99. It was manufactured by James Loomis and Henry Conkey, another machinist from Springfield. It was a brass and steel device with overall measurements: 4.3 cm x 18 cm x 18 cm. The device is painted black on the reverse side and has a green paper label glued with directions for use. It has also a support attached to the back so that it can sit at an angle. The adder consists of two concentric brass discs, one rotating inside the other. The rim of the outer disc has the numbers from 0 to 99 engraved around its edge. The inner disc has 100 small holes marked evenly around its edge, which are also numbered 0 to 99. Two steel arms pivot at the center of the inner disc. The longer arm has a pin on the underside that fits into the holes and a small knob on the upper side so that it can be rotated. A protruding pin set at 0 in the outer circle stops the motion of this arm. The device has a carry mechanism. When the total on the inner disc exceeds 99, the smaller arm advances one digit, indicating hundreds. Hundreds cannot be entered directly. Sums of up to 9999 can be indicated. The second calculating device of Alonzo Johnson is an improved version of the first. 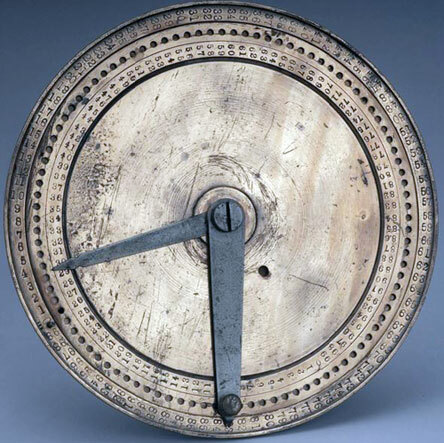 It was a brass, wood and steel device with overall measurements: 16.5 cm x 18.5 cm x 18.5 cm, used to add numbers up to 99. This adder of Johnson also has as its base two concentric brass discs, one rotating inside the other. Again, the rim of the outer disc has the numbers from 0 to 99 engraved around its edge. The inner disc has 100 small holes (also are numbered 0 to 99) marked around its edge. Two steel arms pivot at the center of the disc. The longer arm has a pin on the underside that fits into the holes and a small knob on the upper side so that it can be rotated. A protruding pin set at 0 in the outer circle stops the motion of the arm. The carry mechanism of the device is implemented by means of a smaller arm, which advances one digit, indicating hundreds, when the total on the inner disc exceeds 99. The number of hundreds entered appears in a window in a small disc that is on top of three relatively small gears concentric to the large discs. Hundreds cannot be entered directly. The adder has a handle that projects from the center of the back. Who was the inventor Alonzo Johnson? Alonzo Johnson Johnson was born on 12 February 1828, in Bangor, Maine, the son of Lovisa (Underwood) Johnson (26 Oct. 1805-20 April 1835) and Dolliver Johnson (1800-1884). Dolliver Johnson from Bradford, Vermont, was a railroad engineer, then a superintendent of locomotive power on the Fitchburg Railroad and finally associated with the Illinois Central at Duluth, Wis. Alonzo had two younger brothers: James Underwood Johnson (b. 1831) and George Henry Johnson (born and died in 1835). Alonzo Johnson obviously was an imaginative man and very good machinist, because besides the above-mentioned patents for calculators, he is the holder of 8 more patents for: nut lock (pat. US188055); spindle fastener (US203160); machine for slitting lock nuts (US231492); car brakes (US235152 and US247830); card cutter (US241372); sash fastener (US256144); gumming device (US397798). On 27 Oct. 1850 Alonzo Johnson married to Sarah E. Sinclair (b. 13 Dec. 1827) at Canton, Mass. They had three children: Melissa H. (b. 16 June 1854); Charles B. (b. 16 March 1857); Laura Lovisa (b. 7 Nov. 1858).